Since January 2010 Cathy and Tara have been attending the new training programme based in Lower Main Street in Arklow. An important aim of this programme is to build links with the local community, support people to develop their independence using local facilities, using banks, shops, cafes the library and leisure centres, gaining work experience in local businesses, enjoying voluntary work with Tidy Towns and Coast Care, and generally becoming independent active members of their community. Two of the challenges facing the trainees are negotiating the main street, and the route to the Bridge Water shopping centre. The narrow footpaths are often obstructed by displays or signs outside shops. The high volume of traffic through the town is compounded by the lack of pedestrian crossings between the two main shopping areas. Access onto and off the bridge is very steep, and several footpaths have dishing on only one side of the street, leaving a person using a wheelchair stranded in the middle of the traffic because of the steep step on the far side of the street. These challenges affect anyone who is not quick on their feet, like parents with small children, people with walking difficulties, or wheelchair users. 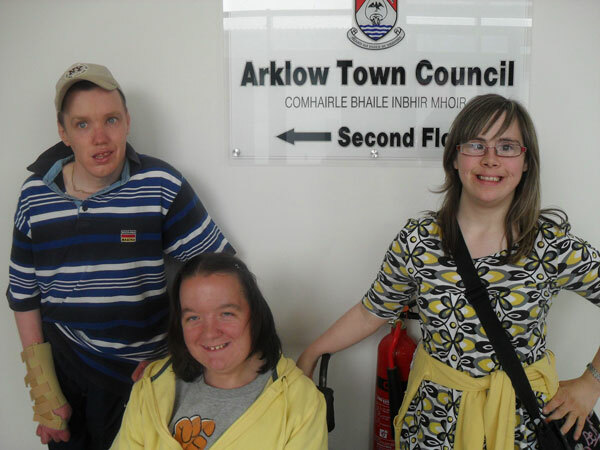 With these issues in mind, Cathy and Tara were supported to write to the Arklow Town Council, requesting a meeting with the traffic committee. While waiting for a reply, Sunbeam Media worked with Cathy and Tara to produce a short film highlighting the main issues they wanted addressed. On 17th June 2010 the Sub-Traffic Committee meeting of Arklow town Council was attended by the Mayor of Arklow, the town engineer and assistant engineer, several councillors, representatives of the traders and the Gardai, the town clerk, and the delegation from SHS; Cathy Macken, Tara Cawley , Gavin O’Reilly and Suzanne Bennett. After our presentation, one councillor observed; “A picture paints a thousand words, and your film leaves us speechless” an unusual experience at a Town Council Meeting! The outcome of the meeting was a promise from the county engineer that funding earmarked for Accessibility issues would be used to address the challenges we raised in Arklow town. When pressed for a time frame, we were assured that we would see improvements before the end of 2010. When The Town Council keeps their promise, these improvements to Arklow will be a constant reminder of People Power.